Sumo is the first production monitor that also records 4K 12bit RAW, 10bit ProRes/DNxHR, plus 10p60 live switching and recording. At home either on location or in the studio this 19' monitor takes Atomos' range of monitor-recorders to the next level. Sumo is the first production monitor that also records 4K 12bit RAW, 10bit ProRes/DNxHR, plus 10p60 live switching and recording. 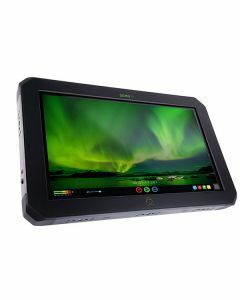 Whatever the environment, home or studio, this 19” monitor takes Atomos' range of monitor-recorders to the next level. The significantly improved power management shooting system enables the user to continue shooting for longer in the field, the 1200nit brightness further assists the act of outdoor recording. Get HDR on set in realtime with on the fly Log to HDR and PQ/HLG playback complete with mission critical scopes such as waveform, focus peaking, false colour and vectorscope on the calibrated screen. Beyond monitoring, with up to 4Kp60 and 2Kp240 recording you can generate instant dailies and proxies direct to affordable and available SSD media offering the professional recording, playback and editing that has made Atomos notorious also comes fitted as standard, of course. The typical difficulties of exposing Log signals on a washed out image are removed in this way. With AtomHDR you simply frame, expose, focus and shoot. All major camera maker’s Log formats are supported - Sony, Canon, Panansonic, Arri, Red and JVC. The Atomos Sumo advances much of the Ninja Flame’s specifications. There are upgrades to HDR, video and audio in/outs and on board processing power. A wide array of accessories are also available.